As we’re all aware (or at least I hope we are), tattoos are permanent and when we get tattooed, the explanation from us to the tattooist should always be clear and concise. There’s no point in only telling the artist a little about what we want, we have to be clear. When clarity isn’t part of the equation, people get tattoos that they don’t necessarily want and will most likely regret. It’s a pretty easy dynamic to comprehend: we help the tattoo artist, he or she helps us in return. Right? ‘Mr Flavell, who is in his mid 20s and runs the Berry Street shop with girlfriend April Gibson, said he took the sign down a few hours later after worrying it could be ‘misconstrued’. He said: “We’re not racist. We would never dream of saying we won’t tattoo people because of their race or where they may be from. 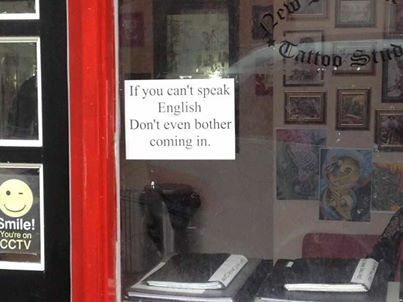 “The reason for the sign is tattoos are permanent and we cannot take the risk of making a mistake because we cannot communicate with a customer. “We had death threats on Wednesday when an Iranian man came in. The price was £90 for an tattoo he wanted on his back. But he only wanted to pay £70. He became very aggressive then got three friends who were waiting in a car outside to come in. “He was threatening to kill us. We called the police and he was arrested. I can see both sides of this story. For starters, as I previously stated, it’s vital that a tattooist know what’s going on with the work he’s doing, just as it’s vital that the customer understand as well. If a customer can’t communicate due to a language barrier, things aren’t going to go well. On that part I totally agree with Flavell. But all that being said, there are much, much better ways to deal with problems of this nature than what Flavell did. The biggest point here is that anyone who can’t speak English wouldn’t be able to read a sign in English! I don’t think Flavell was being racist, I just think that he didn’t consider what he was doing. The easiest way to deal with future situations like this is to make a sign in numerous languages stating that if you can’t effectively communicate with the artist, you will need to bring an interpreter of some sort in order to aid the process. If communication can’t be clear, then the artist won’t tattoo. I think that this is an important lesson for all tattooists: no matter what, first and foremost you always have to help your customers to help you. It’s that simple!